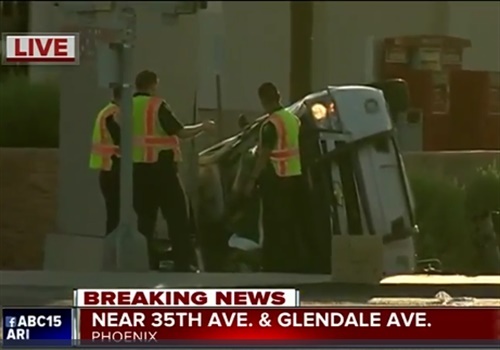 Two Phoenix, AZ, police officers were transported to the hospital following a rollover collision in west Phoenix Sunday morning, reports KNXV-TV. Just after 4 a.m. authorities responded to a collision involving a Phoenix police officer and a truck near 35th and Glendale avenues. Phoenix fire said they transported a 32-year-old male officer to a hospital after his car had rolled over. The officer suffered serious injuries, according to the Phoenix Police Department. A second officer, a 30-year-old woman, was taken to the hospital after she received injuries to her hand after she tried to help pull the officer out of his vehicle following the rollover, police said. Fire officials say a third patient, a 31-year-old man, suffered a head injury and was taken to the hospital after he had to be extricated from his truck. Witnesses told police that the officer's vehicle and truck collided as the officer was traveling northbound on 35th Avenue while the truck turned left onto Glendale Avenue from 35th Avenue. "He is in serious condition until we know more about what the extent of his injuries. We did have a second officer that sustained an injury to their arm and to their hand trying to help him get out of the vehicle," said Capt. Mark Heimall of the Phoenix Police Department.